Often times at M&M Income Tax Service, we get asked; “What can I deduct on my taxes?” This question is an effort to reduce income and in effect reduce taxes, which should generate a bigger tax refund or a smaller balance due. Typically, there are two items that trigger “Itemized Deductions”. The first is mortgage interest and the second would be unreimbursed business mileage. Why do we say trigger? Because to actually help you on your tax return your itemized deductions must exceed your standard deduction. 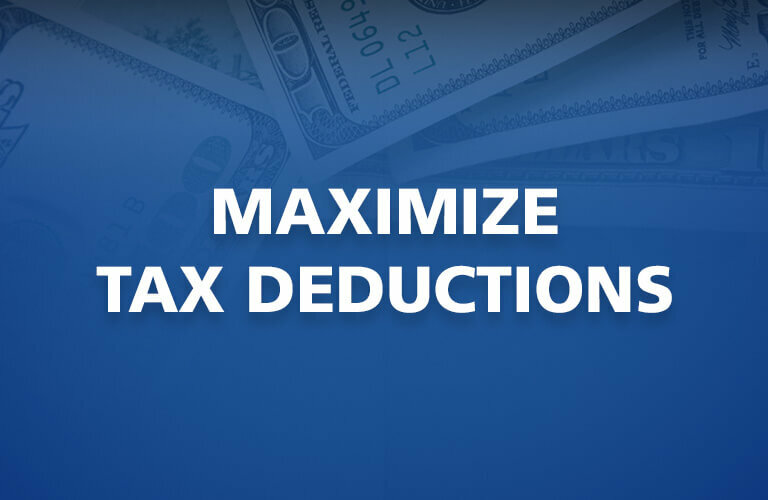 The key is once you identify you may be eligible to itemize your deductions, you want to gather all the different types of eligible itemized deductions in an effort to maximize your deductions. Below, we discuss the most common itemized deductions and what to look for. If you own your own home or auto, you generally have property taxes that are tax deductible. Typically, property taxes are paid to the county you live in and are deductible in the year paid. The most common property taxes we see are real estate, auto, boat and/or boat motor. Often times, if you do not have the tax receipt, we can go to your county website and look these property taxes up for you. Mortgage interest is deductible on your tax return and is often the first clue that it may be beneficial for you to itemize your tax deductions. Mortgage interest is reported to you annually on a Form 1098 issued by your mortgage company. Often times, you may receive more than one Form 1098 reporting mortgage interest if you have a second mortgage, a home equity loan or your mortgage company sold your loan mid-year. When talking about mortgage interest, we often get asked about credit card interest and interest on auto loans (i.e. personal loans). Credit card interest and interest on personal loans (i.e. auto loans) is not tax deductible. There are two types of charitable contributions; money contributions (i.e. cash, check or charge) and property contributions (i.e. clothing, furniture, car, land, etc.). Charitable contributions must be made to a qualified non-profit organization. There are millions of qualified non-profit organizations. Contributions of Money -The most common qualified organization for most people to contribute is their church. Other popular non-profit organizations are your local school, the American Cancer Society, American Heart Association and United Way, just to name a few. Contributions of Property - Contributions of property (i.e. clothing, furniture and appliances) are deductible to the extent of fair market value at the time the items were given, not what you originally paid for the items. Think of it as thrift market values (i.e. if you were going to have a garage sale, what would you price it at to sell?). Goodwill and Salvation Army are popular non-profit organizations that accept property contributions and give you a receipt for your contribution. Contributions of autos, land or real estate are also tax deductible, but require additional reporting, valuations and documentation. These tax deductions are subject to 2% of your adjusted gross income (AGI). In other words, these deductions must exceed 2% of your AGI, before they will begin to help on your tax return. So if you make $100,000; your Job Expenses and Miscellaneous Deductions must exceed $2,000 before they will start to help on your tax return. There are lots of Job Expenses & Miscellaneous Deductions, but most are never used because they are so obscure people simply do not qualify for them. Here are some of the most common Job Expenses and Miscellaneous Deductions we see. Mileage, meals, travel & lodging incurred as a necessary expense to work, but was not reimbursed by your employer. Often times, this is a sales person that travels with work. Uniforms required for work, if not appropriate for wear outside of the workplace. Education courses you take to improve or maintain job skills, but not to qualify you for a new job field. Expenses incurred in looking for a new job. Dues paid to a union or other professional society. Home-office deduction for business use of your home. Investment and legal fees if they helped you produce taxable income. Tax preparation fees you paid a tax professional.